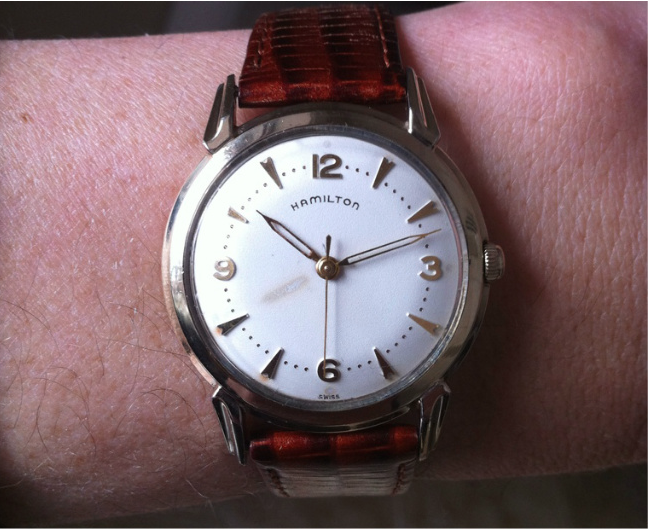 In 1957 Hamilton introduced the Viking and produced it though 1960. 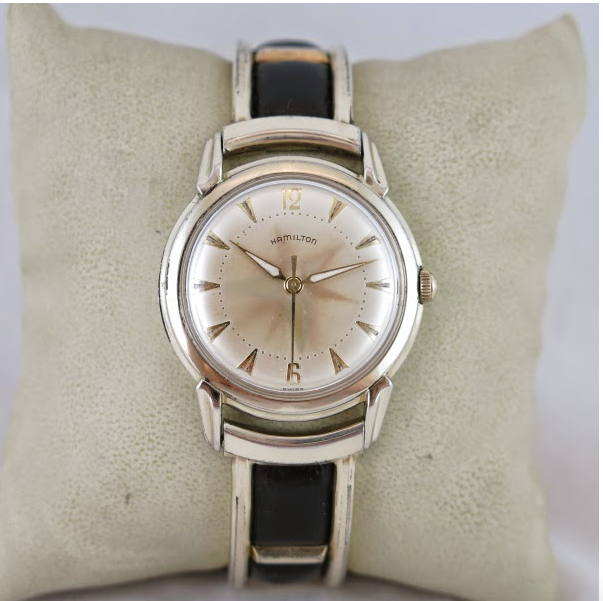 The Viking is one of the "Fine Hamilton Watches" that Hamilton sold with Swiss movements that were purchased to lower the price points for some of their line up. The Viking features a yellow RGP case with stainless steel back and distinctive-scalloped lugs. 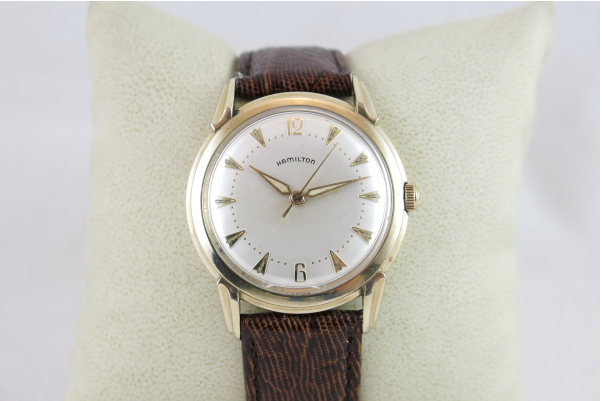 It also has an embossed (stamped) dial with luminous hands and luminous markers on the dial. The movement is a Swiss 11.5 ligne movement but I don't recall the exact grade. I had a Viking a while back that has since gone on to a new home. Here's a wrist shot of it. You'll note the mark on the dial by the 8 is a "radium burn" - and is caused by the radioactive luminous material on the hour hand staying in one place for many years. I didn't notice until this post that my dial is a little different than the catalog image... this one has a 3 and a 9 instead of markers. 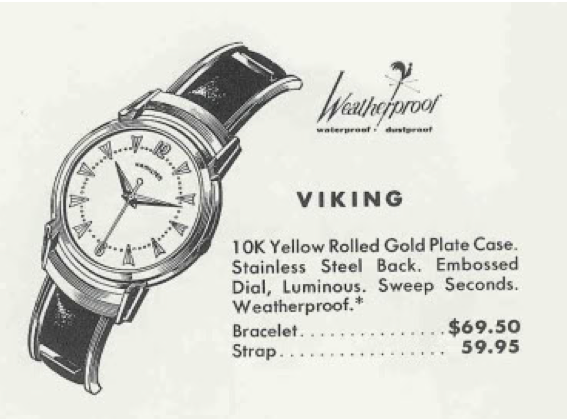 This might have been a "franken Viking"... a Viking case with another watches dial. UPDATE - I purchased another Viking recently and it has the correct dial. You can see by comparison that it's very similar. Based on the radium burns on the dial above, I'd wager it had been on there a long time and is likely original. However, the one below is a spot-on example. I purchased yet another Viking (a deal I couldn't refuse) and it came with it's original bracelet made by Kreisler. Check out what the radium lume did to the dial. I guess the watch was used and sat for a while, then got used and sat for a while, over and over resulting in the radium burning a mark into the dial. The watch is well-worn though - so it had a lot of use between sitting for long spells.